Students look over books that were donated during a recent drive. This past spring, the third and fourth grade students at St. Richard School spent some time reflecting on kindness and brainstormed ideas of different types of projects they could do to make a difference. An afternoon of reflection in early April, and gleaning inspiration from a service project they saw on randomactsofkindness.org, led them to decide to hold a book drive to help children in other schools who may not have access to very many books. The book drive ran for two months. 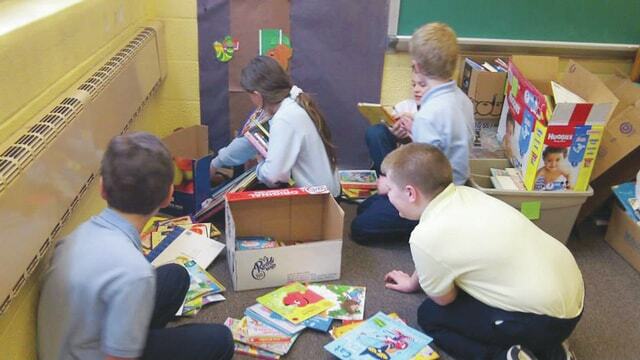 The students enlisted the help of family and parishioners to help them stock up on some “good reads” to donate to their cause. Physical education instructor Mrs. Sue Fessenmeyer, rallied behind the cause and helped the students make bookmarks that they decorated and wrote positive messages on about something they believed in. By the end of the drive, the students were impressed with the number of books they received – totaling more than 1,100. The children helped sort the books to prepare them to be sent to two different schools, Queen of Apostles School in Toledo and Heir Force Community School in Lima, Ohio.